I got a little bit carried away while developing this, but it's fun to do. I don't use bitmap graphics because they don't scale well, and I like to keep things clear and simple. I used Geyser for the GUI. The top left lists the currently active spells, buffs and affects. The thickness of the blue border tells you how long the spell is still active for. If the border flashes, it will be active for less than 30 seconds. Moving the mouse over an affect shows you the name and the active time left. For the images I use a spritesheet instead of individual images. The angel wings show positive alignment. The brighter the image, the more saintly you are. If you have a negative alignment, a red devil shows up on the left instead. The MUD supplies the hour by MSDP, the GUI calculates the minutes based on the last time it received an hour update. The help link opens up a menu with help topics, which in turn display help on the main window. The options link shows a menu of toggle-able options. Clicking an item toggles that option. The minimap data is supplied by the MUD. For the tiles I also use a spritesheet instead of separate images. Underneath the map it shows the room name and the area name. The coloured bars display (in order): Experience, movement points, stamina, mana, health and enemy name/level/health (only if you're fighting). The chat log at the mid-top is toggle-able, resize-able and move-able. This was tricky to do in Geyser. Self updater. The plugin checks for new versions and installs them automatically. Whenever someone connects or disconnects it is displayed in the main window. Whenever you identify something, the description is stored as well as the location you identified the item at. You can list or search through all the items you've previously identified. You can configure a buff list. Calling a buff check then sees if each buff on that list is active, and activates it if it isn't. 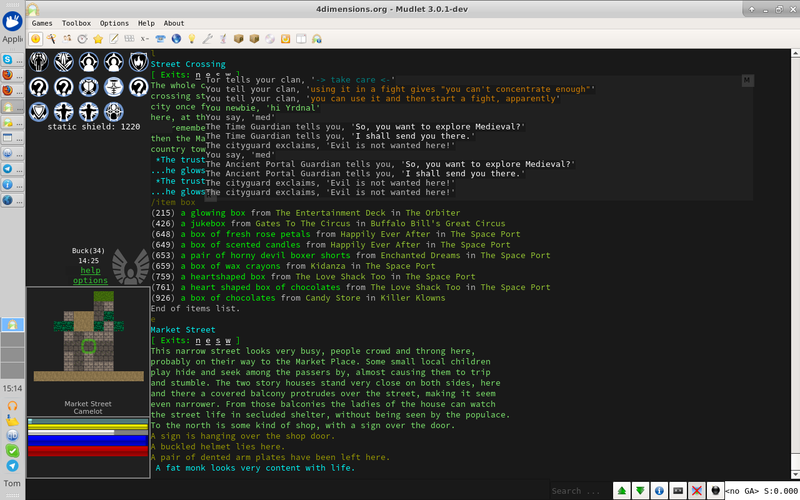 A custom alias engine. This is to make it easier for novice users to add aliases. It supports variables that you can set yourself. You can also set aliases specific to a room or zone. A mush like trigger engine. In order to convert more of our players from mushclient to mudlet, I had to make them able to use mushclient triggers. 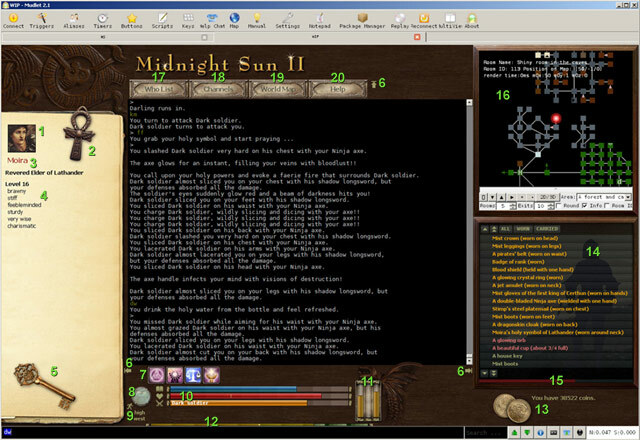 Many players find Mudlet's alias and trigger interface complex and confusing. Both the alias and trigger engine are operable completely from the input line. Stats tracker command. This makes a snapshot of all numeric data sent via MSDP. If you call it again, it shows the variables that have changed and by how much. This is useful if you want to check what difference a certain piece of equipment or spell makes. A note system that lets you make notes globally, by zone or by room. There are a few other minor things as well, but this is the bulk of it. I applaud you Buck. I find the blue rings you use as cooldown timers very clever! How are you doing this through Geyser? Akaya wrote: I applaud you Buck. I find the blue rings you use as cooldown timers very clever! How are you doing this through Geyser? Thanks Akaya, I appreciate it! I posted some explanation on how to use the aliases and triggers here: http://forums.mudlet.org/viewtopic.php?f=6&t=16462. If you need other details, let me know. 1. Character avatar. About a hundred avatar icons come bundled with the GUI for the player to choose from. 3. Character name and title. 5. House key. If the character owns a house, the key will be shown here. 6. Layout adjustment. Clicking these arrow icons collapses any or all of the left, top and right sections. Useful on smaller resolutions. Since the upgrade, Mudlet will remember which sections you had collapsed. 7. Active effects. Icons that show what spells or skills are affecting you. 8. Alignment indicator. The gem gradually changes colour from dark purple (demonic alignment) to bright white (saintly). 9. Wimpy info. Shows the level and direction of wimpy. 10. Vitals gauges. Mental, physical, opponent health (and opponent name). The health bar also has an indicator of wimpy level. 11. Fullness gauges. Show how much more alcohol, food and non-alcoholic drinks you can consume. 12. Exp gauge. Shows experience progress to next stat. 13. Money. How much money you have on hand. 14. Inventory. Equipped items are shown in yellow, kept items in red, carried items in tan. Can be filtered using the buttons at the top. 15. Burden. Shows your burden level. 17. Who list. Not yet active, needs more gmcp support in game. 18. Channels console. Ditto, we need to add more gmcp support in game first. 19. World map. 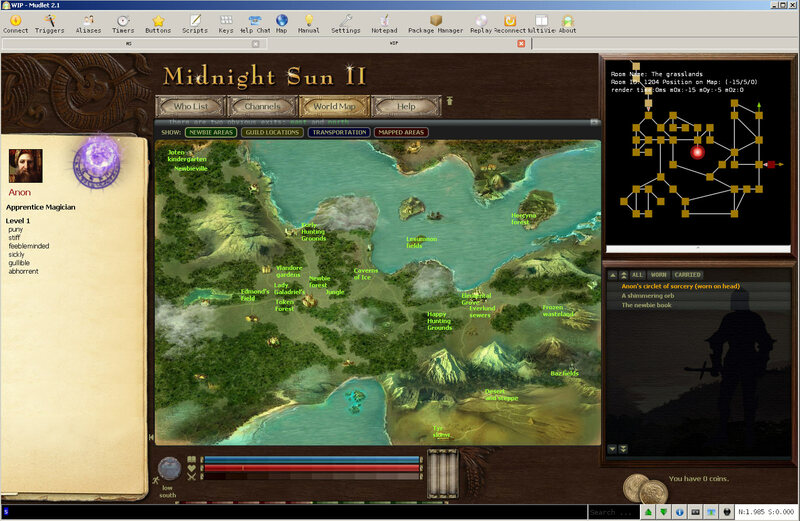 Opens a graphical world map that can display guild locations, newbie areas, mapped areas or places of transportation (ports and dragon hitchhike points). If you want to check it out, it now autoinstalls, but it only works on Mudlet 2.1 (for some reason the autoinstall freezes on Mudlet 3.0). Sure, updated. Do you have a version with a more modern Windows look? That one looks like it's from the 00's. Could I add this to the Mudlet screenshots page? Sorry Angie, I did not realise you are behind Midnight Sun 2, but I do like what you have done with what we've nailed together.